How do you make a staycation feel like a real holiday? This summer we are staycationing. Neither me nor the bubba has a valid passport and quite frankly, having a new baby, we sadly don't have the money either to go gallavanting abroad. We are going to have all four of us home - me (and the baby) on maternity leave, husband working from home and our older daughter off school. It is nice to have the whole family home of course, but at the same time, it would also be nice to have a holiday together. I have wondered thus, how to make our staycation to feel more like an actual real holiday - what kind of things could we do to make it a bit more special, and what kind of things could we go and see. 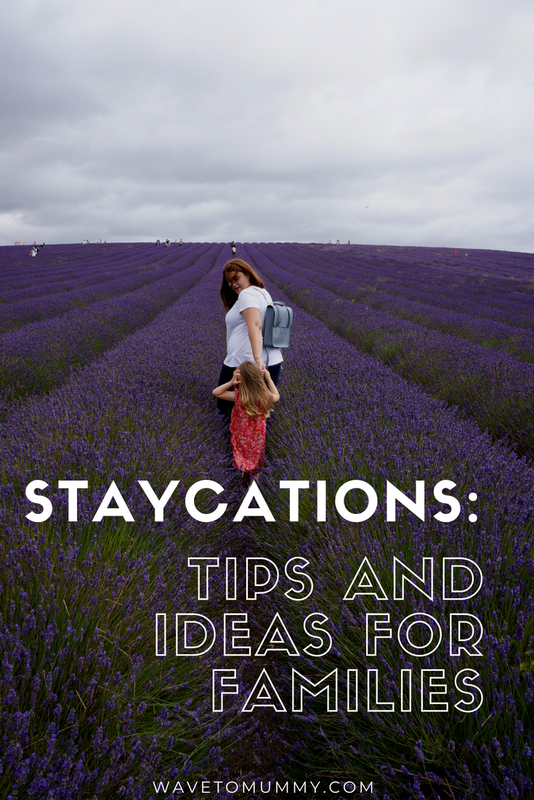 So here is a collection of ideas and tips I am planning to follow during our staycation to make it feel more like a proper holiday. I asked a few blogger friends to give me their ideas too, and they had some great tips for staycations! It is so easy to just do a bit of work when you are home - especially if you are self-employed. There is always something you could do or should do. Even if you are employed it is so easy to just check a couple of emails on your work phone, or start thinking about project plans for the future. So be strict, turn the work mode off and holiday mode on. Sophie from Soph-obsessed explains, "Reduce and limit the use of phones and laptops. A vacation should mean no working but it's easier to be still responding to emails when you are on a staycation. I still make sure my out of office is on and my phone is on do not disturb!" Chores, chores, chores.... That's probably the biggest thing you are missing when you are on a holiday. Like Maria from Happy Mummy says, make sure you have "no cooking or cleaning just like if you were really away! Get up go out for breakfast, have a nice day out with lunch and stop for dinner on the way home." So if you want your staycation to feel like a vacation, those chores should be minimised. Get a cleaner in a couple of times a week, and let them deal with the housework, and eat out. Granted, this is not the cheap option, but definitely makes it feel more like a holiday when you don't have the daily drudgery to deal with. When you live somewhere for a long time it is easy to miss out on visiting the local touristy things - like my husband who still hasn't visited the London Eye, despite it having been here nearly 20 years already... So, when you are having a staycation, it is the perfect opportunity to visit all those interesting places you never seem to have time to do during the week. Even if you don't live in a touristy area, I can guarantee there will be plenty of new places to explore locally. Victoria from Lylia Rose recommends making a proper day out of it. She says "plan days out every day so you're out most of the day. Even if exploring the local area, try and go somewhere you've never been. Don't buy normal groceries - go wild and have something different, including lots of treats and easy to prepare meals! Take lots of photos and wear lovely holiday clothes." Leaving the house and acting like you are on a holiday helps too. Have a day out, go to a new place to eat, and wear nice holiday clothes, and skip the telly in the evening in favour of spending some quality time together. Jo from Cup of Toast says they "have days out so it feels as though we've had a break from the house. Meals out in new places or pubs with large gardens where the children could burn off some energy. Pay for a cleaner to come in a couple of times during the week so we can ignore the chores. When we are at home, turn off the TV and read books instead or play a board game in the evening when the children are in bed." I loved the idea from Kate from Kate on Thin Ice for a 6 week, travel from home type of vacation. She suggested prepping a 6 week learning holiday - six countries in six weeks, where you have different recipes and foods every week, and "also incorporate learning about flags, culture and costume" for each of the countries. While this requires a fair amount of prepping, I think it would be such a fun and educational thing to do with kids over the summer. With older kids you could also ask them about the countries they would like to learn about and make them do the research, finding out what foods they would like to try and find some books for them to read about the country. In a large city such as London there are also opportunities to visit museums, restaurants and even cultural events to learn more about certain countries! This summer I am planning us seeing some new places locally. There are so many gardens and flower fields and other places to visit not too long a drive from us, so we will pack a picnic and go see some flowers or something. Or a new beach. Previously we have been to Hitchin Lavender fields and also a beach just an hours drive away from London and these would be nice to visit again. In addition, I have a corporate family membership to the English Heritage and Historic Royal Palaces so we will see at least one castle at some point. We recently went to Tower of London, and have visited Dover Castle in the past. I have also converted some of our Tesco Clubcard points to tickets to nearby zoos - always a good idea with kids! And of course, we have London and all the great attractions there at our door step, so where possible, we will be visiting museums and other places there too. What would you do if you spent your holiday at home?